We all know that events that occur in our childhood can have lasting effects throughout our lives. My mother loves the theater, art, museums and galleries. Her home has always been filled with art and music. I took many of the pictures for granted given that they were there before I was. *grin* But as she acquired new works of art, I formed my own opinions. Mostly I liked her choices. Until she bought what I call “that apple picture”. I HATED this picture. Hated it. She LOVED it. My good friend Sarah is also an artist. She was an artist even then. Sarah liked that picture too. Now comes the “scar”. My mother turned to me and said (in my opinion very smugly and condescendingly) “THIS picture separates the TRUE artists.” *blink* There was no doubt in my mind that I had been weighed, judged and deemed inferior. I HATE that picture. Why do I hate it? Because you can’t FIX all those pieces of fruit. They don’t match up. Check the number of seeds. The shape. 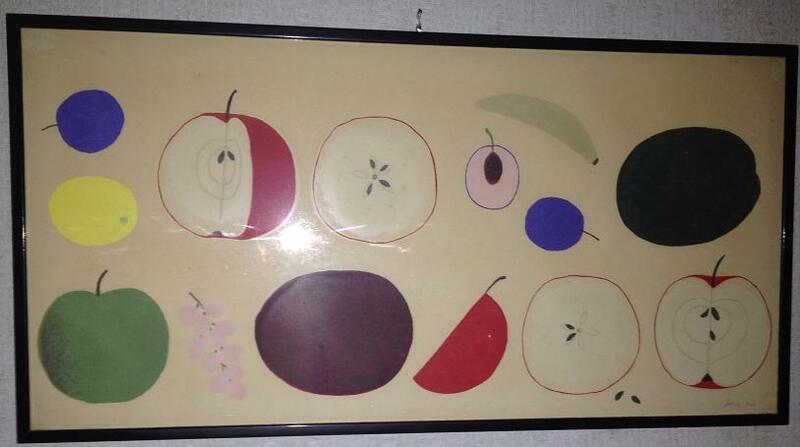 The picture was pointless (the fruit wasn’t DOING anything). It was unbalanced (not visually, but conceptually). Not only that – one of the apples had littered seeds – messy. I looked at that picture and what I saw was the equivalent of Humpty Dumpty. And I was frustrated and thwarted. I’ve acquired a new mentor at work. She is helping me to focus on what I do, what I can do better, what I might like to do in the future. So I’ve been doing a lot of thinking about who I am, what I am, how I work and think. I saw an article about “how to find your passion”. It described personality types and what people with those traits like to do. I realized that I think of myself as someone who fixes things. (Which, in a side note, is how my father defined himself. He said “I’m an engineer. I solve problems.” *grin* I love and miss you Daddy.) And then, the clouds parted, the sun came out, I had an epiphany. That picture is NOT about identifying the artists. Oh my NO. That picture is about identifying the “engineers” – the ones who SOLVE PROBLEMS, FIX THINGS. I try to pretend I’m not, but I am. Superstitious. Like Hamlet, I believe there are more things in heaven and earth than are dreamed of in Horatio’s philosophy. I see connections that may or may not be there. I see causal events that might not have been the catalyst. I believe in karma. The past year was perhaps one of the most difficult of my life. I couldn’t seem to reach my inner energy, to see where I was going, to see clearly. Somewhere in the last year, my portrait in SL blurred. It’s my profile picture, taken by the inimitable Callipygian Christensen. I have had it hanging on my bedroom wall for a few years. You know how it is with things you see daily – you stop “seeing” them at some point. I began having a vague notion that the photo was blurred, but I thought it was a matter of impatience on my part – not waiting for it to rez all the way before moving on. Then I realized that no, it NEVER rezzed clearly anymore. I thought about it, did nothing. Finally several weeks ago I mentioned it to Calli. She thought it sounded very odd indeed. But we never got around to going to look at the picture together. Time passed and it was Chanukah. Lalo came to light candles and he said yes, your portrait is definitely blurred. More time. Finally came a moment when we were all inworld with time to decipher the situation. Calli, Lalo, Oura and I stood in the room and saw a blurred photo. We couldn’t fix it. We were using 3 different viewers. All blurred. I think it was Calli who figured out that if she rezzed the texture of the photo (which she still had) that the photo came into focus. I think Lalo called up my profile and when THAT rezzed, the photo on the wall came into focus as well. Calli gave me the texture, I rezzed it. When it rezzed, the portrait came into focus. No, we don’t know why. I will tell you that I can still go into the room and the portrait is blurred. But now I have my magic charm. I rez the texture and the portrait rezzes too. Look at this. 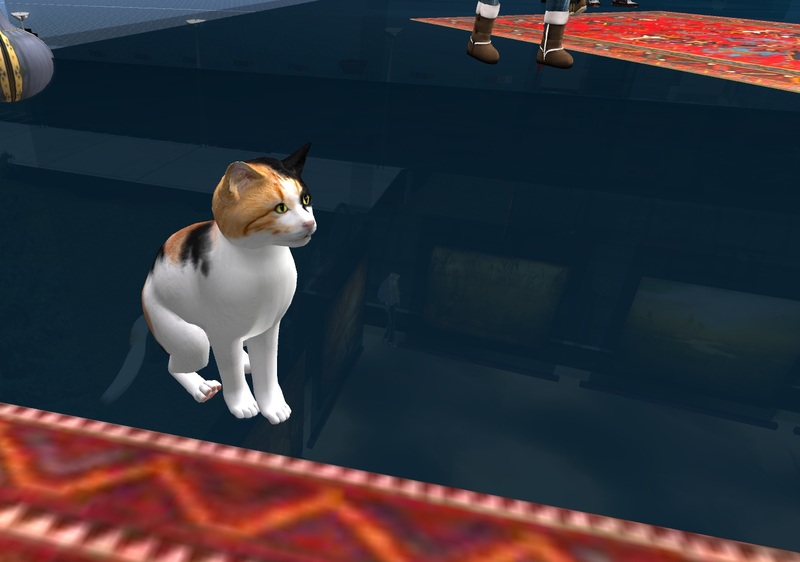 The new year is less than 2 weeks old, and I’ve made it to TWO art shows in SL PLUS a museum in my atomic life. Could I be joining the educated art elite??? Naw. I have family and friends with excellent taste. Calli gets the SL credit again (my husband managed the atomic world maneuver). Calli was DJ’ing for Kerry Streeter, who has opened a new gallery, Second Looks, on Zeno Ochs’ wonderful art sim Gemini Elysia, with the wonderful Vertex Gallery. I’ve come to see RL photos as something “monstrous” in SL, maybe alien pods invading from another world. They just don’t really belong here. 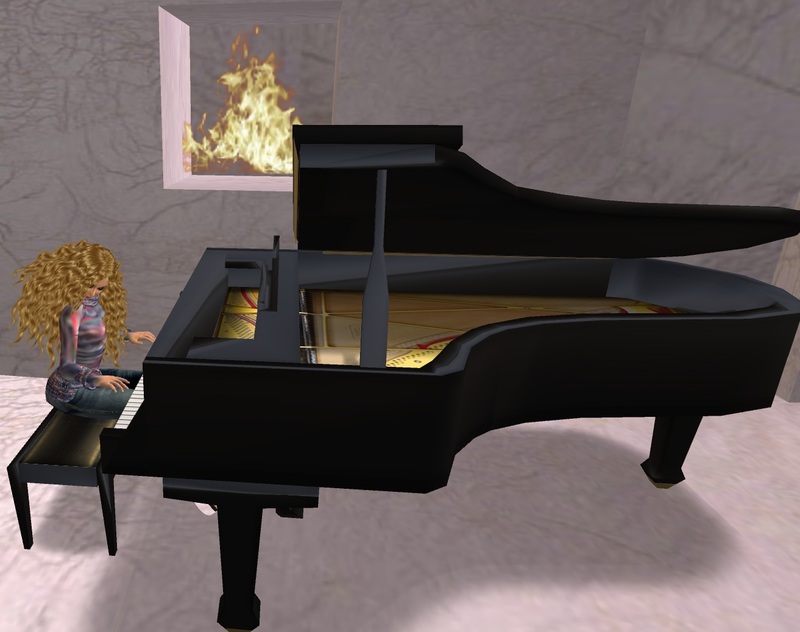 But SL provides a wonderful space for an amateur artist like me to gain exposure and feedback. The Twilight Musem has a permanent retrospective show of much of my RL work. The photos aren’t for sale there, but if you see anything you like, send me a notecard with the details. I’m happy to sell them directly at 300L apiece. A good number of my atomic world foibles have followed me into SL. One of those is the need for solidity under my feet. I remember a fashion show several years ago that had a nearly invisible ramp. Attendees had to wander up and down this see-through invisible ramp. I ended up nauseated and with a major headache. Not my avatar – my biological body. I really WANT and NEED something solid beneath my feet (why I will never be able to ski). I did enjoy Kerry’s art, but you can see that the floors and the stair are somewhat transparent. Once I’m fully rezzed, it’s not too disconcerting since the space is otherwise confined and defined. But I was very disoriented as I rezzed, since I was looking THROUGH the floor. 🙂 You’ll notice that after a bit, I joined the cat on the couch and used my camera to view. Yes, I admit it – I’m a wimp. The cat is an avatar, one of my good friends trying out a new look. It’s a great av, wonderful built-in movement and gestures, right down to the twitching tail and paws that knead. Be sure to stop by Kerry’s Second Looks Gallery in Gemini Elysia. There is something for everyone at this exhibit. I’m not good with change. If things are going to change, I’d prefer a lot of lead time, a lot of information, a measure of control, a schedule, detailed instructions. I’m not one of those women who use a different purse for each outfit. I don’t look at my house and decide “let’s repaint this room”. I hate shopping for furniture, wall-paper, paint, accessories. “If it’s not broke – don’t fix it” works for me. But every now and then, even I realize that a bit of change might do some good. That notion first began to creep into my head when I was reading Inara Pey’s blog way back in November. She reviewed the PrimPossible line of furniture by Ample Clarity. Ample uses sculpties to build furniture – and does it all with a single prim. Not just A chair in a prim. But Ample can do a pack of char/sofa/rug/table/plant/etc for ONE prim. Not only a single prim – but with animations. I run out of prim space repeatedly. 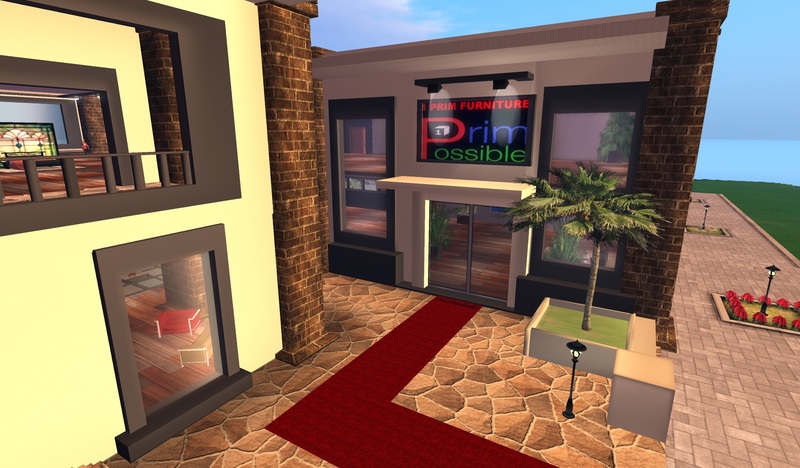 One prim furniture? That would gain me a LOT of room. I wandered over to PrimPossible to see what was there. The furniture is more modern and streamlined than my usual taste, but it looks so good all put together. The sets are out on display and you can bounce about trying them all. There are more chairs and sofas upstairs as well. I went there several times – alone, with Lalo, with Oura. Everytime I was there, Ample Clarity IM’d us, greetings us warmly, offering to answer any questions. He’s NOT pushy – he’s warm, friendly and properly attentive. I began chatting with him about the line, explaining that while in one sense I didn’t NEED any furniture, I was intrigued by his one-prim creations. I think that had I not recently spent time adjusting all the poses in my hot tub, I’d have ditched it and gone home with the one-prim version from Ample. That may still happen. 🙂 I explained to Ample that what I really wanted at the moment was a chair with poses (most of his sofas have multiple poses but the chairs have a pose). Ample told me that he was in the process of coming out with a new item – sofas that could be retextured. I thought that was great and asked about the possibility of his adding poses to chairs. Ample doesn’t do custom work, but my timing was perfect. He was still in the early stages and could add poses. He decided that the concept had merit and so he told me to come back in a week for chairs with poses and the retexture feature. I thanked him for his help and said I’d be back. I think Lalo was with me that time. As we said our goodbyes, Ample gifted us both with a free one-prim piano. It’s extremely attractive! It has multiple poses, allowing for a single pianist or duets. The piano plays songs as well – pick from Bach, Brahms, Couperin, Grieg, Mendelssohn or Saint-Saens. I went back with Oura in a week. The new chairs are more rounded and padded than the previous style and that works better for my tastes. There are many textures you can choose. There are single poses (guy, girl, unisex, and silly) and couple poses too. In other words, the chairs are a delight. One-prim, reasonably priced. Again, Ample gifted both Oura and I with freebies. I have both my chairs tucked into the corner of my bedroom. I find during the winter I spend more time there than in the sky box or by the pool. I LOVE the chairs. They are perfect for sitting and shmoozing. I love doing business with Ample. He is gracious, attentive, he listens, he has a sense of humor and he does great work. I see that he is now doing kitchens as well as lounge and bedroom suites. Were my bed not a gift from my dear friend Bailey Longcloth, I would be over there at PrimPossible getting a new bed, too. Go check it out for yourself. My good friend Hunter took a break from SL for a bit, but he returned this past fall. YAY!!!! SO glad to have you back in town, Hunter! And Hunter looks better than ever because he is accompanied by the lovely Catarina. Hunter and Cate expanded my life by introducing me to the Vroom Vroom Reindeer. *grin* But they expanded THEIR lives by having an SL baby! So the Cales are now THREE: Hunter, Cate and Quakenado James. 🙂 Isn’t he adorable? And so well-behaved too – no fussing or complaining even though we were hanging out at lucky boards chatting. I have to mention these lucky boards and the lovely lovely jewelry you can buy and win. yoona Mayo is the creator of ::Cocoon:: jewelry. I LOVE her work. I first encountered yoona’s jewelry when I was modeling for Shenlei Flasheart. Shen often paired her outfits with yoona’s jewelry and I had some great necklaces from then. Shen had another fashion show in January (Auld Acquaintance) and sent me the Look-Book for it. Her dresses were gorgeous and paired again with yoona’s jewelry. I fell in love with one of the necklaces and KNEW it would be perfect for my Erev New Year’s Eve dress. I contacted yoona to confirm the style name (Isis). yoona not only gave me that information, but also clued me in to her shop *PDD* Pas De Deux Annex in Juliet with all the lucky boards. *grin* Of course, she’s very clever besides generous. You can’t win BOTH the earrings and the necklace of a style. You’ll end up buying one of them. But her prices are soooooo reasonable and the pieces are well worth the L$s. So Cate and I were hanging out at the lucky boards, chatting, when Hunter and Quake showed up. We got to talking about past events, and dress up affairs, and ball gowns, and lucky chairs. I remembered one store that I adored. It had a lucky chair and the most gorgeous outfits. Several of the clothes I’ve been wearing this winter season were from Haute Couture Sim Fashion by Moxie Polano. Several months ago I’d gone looking for HC, but I must have used the wrong LM and didn’t use search and so I didn’t find them. While we were talking, Hunter and I both searched and found Moxie and the store. So we tp’d there to look at the fashions. Still stunning, but no more lucky chair. *laughing* That lucky chair was SOOOOO popular, there was a velvet rope put up so we wouldn’t crowd the chair, and we had to wait behind the rope, hoping for our letter. The dress I wore for Erev New Year’s Eve was Moxie’s from Haute Couture. I staked out that chair for DAYS to get that dress. 🙂 I’m so glad Moxie and HC are both still here. Back in December most people were blogging about great winter scenes and holiday exhibits and fantastical snow scenes. I made notes of places to visit when I had the time. January has been spent catching up on the sight-seeing. *grin* Or would that be “site-seeing”? One of the posts showed a North Pole Sleigh Ride. I did save that link, but either my timing was off or the picture didn’t actually match that slurl. I dragged Lalo with me to explore the North Pole. We were greeted quite warmly for such a snowy place: North Pole Greeter V2: “Psssst! Over here! It’s me, Santa’s favorite elf! Welcome to Atrum Complexo! Hop on a sleigh, cuddle up in your blanket. North Pole Greeter V2 gave you ‘Hot Cocoa’ We didn’t find a SLEIGH ride, but we DID find a SLED! I jumped on first so I got to drive. Lalo seemed a bit perturbed when I took us THROUGH the tree instead of around it. Pfffft. One tree, what’s the big deal? But it’s very hard to take pictures AND drive, so I agreed to let Lalo steer instead. I admit, he did better than I. At first…..
*grin* Anyway, we had a lovely time sledding. There are some not-nice-neighbors who have a security system with a faulty timer. I got a message that I had 20 seconds to evacuate. I’d not even finished reading that when it kicked me home. No, it didn’t take me 20 seconds to read. Other than those neighbors and our dunk in the water (I REALLY don’t want to hear about the tree anymore), we had fun and hot cocoa! I’d suggest checking it out soon, as I don’t know how long it may be there.